Not had an issue with Voxi so far in 5 months. I like the fact it's just a 30 day rolling contract, good live chat contact option; a decent signal with Vodafone, no complaints here! "Good Deal But No Customer Service"
Voxi offers good deals if you are 30 years or under but if anything goes wrong then it is impossible to speak with customer service. You can talk to customer support via live chat but for some bizarre reason they can only do particular things but not everything, they will refer you to twitter or facebook who will then pass the buck to third parties. It has taken hours of my time and I still not resolved my issue with the SIM. "Switched from Vodafone to Voxi"
I moved from Vodafone to Voxi today and was up and running within 6 hours. Because Voxi are basically Vodafone it seems easier to move, there is a number to call and you don't need a new SIM card. You keep the Vodafone one, and the number. We lost a bit of time as the guy typed in the wrong email address, so when the arrived to say "Voxi is now available" we didn't get the email advising the website login/password that you need to actually go online to buy the plan you need. Managed to update that over the phone and from there we picked the plan, entered the credit card details and about 45 mins later the plan was activated and then had to configure the data. So far I'm a happy camper and it is a very good price. Very poor service. UCAS emailed me about this sim, so both me and a friend signed up. Our coverage was awful, my phone would never work when I left the house (we live in London). The only way to contact VOXI is by online chat, which is slow and terrible. I spoke to them several times and updated all my settings, the signal was still dead most of the time but they eventually agreed to give a refund which I still haven't received as of yet. Voxi make buying phone plans from their website insanely difficult! They make all kinds of great claims for them: “all VOXI plans come with Endless social data, endless calls, texts and picture messages, and endless roaming in Europe”. But first of all they tell you that you have to have a Voxi Sim card to even see the details of their plans, and then they tell you that you have to be under thirty years old to qualify for one! (How do they enforce that?) Why they have to make it so difficult I have no idea. I gave up in the end, and they lost a potential customer. "Free Amazon Voucher with Voxi"
My mate put me on to Voxi because they give you both a free £10 Amazon Card when you sign-up a mate. Really colourful cutesy website, nice & bright! It's sim-only and no-contract, plus you get "Endless Social Data" which means Instagram & Facebook etc don't count towards your monthly usage. Got my new sim after about 6 days and the Amazon card a bit later. Do read the small print on the website though about the endless usage as it only applies when you've still got normal data left on your plan! "Love a bit of VOXI"
I would really recommend Voxi to anyone looking for a SIM only deal. My plan was very reasonably priced, and they kept giving me far more data than I was paying for as a reward for being one of the first customers to join! I also got a free phone case. In the rare event, I had an issue, help was easily accessible via live chat, and the employees who I communicated with couldn't have been more helpful. When I wanted to leave (I now need a plan with a phone) they made it so easy, which hasn't been my experience with other phone networks in the past! Voxi is an MVNO and it’s owned by Vodafone. Voxi does not own its own mobile infrastructure and uses Vodafone’s network to provide service. Previously, in order to qualify for service from Voxi you had be under the age of 30 but this changed in 2019 and it’s now open to all ages. With Voxi you’ll get the same coverage as Vodafone customers since Voxi uses Vodafone’s infrastructure. That means 98% 2G coverage, and 96% 3G and 4G coverage. It’s always best to check your local area with the coverage map you can find on the Voxi website just to ensure that you’re going to get good reception! You can also top up your phone with additional credit if you like (to pay for international calling or calling special rate numbers). You can do this on top of your monthly bundle, or you can choose to opt out of a bundle altogether and use only pre-paid credit. However, if you do this you will NOT be allowed to use any mobile data. Without one of the above bundles, calls will be charged at 30p per minute, and texts are 14p (45p for MMS). Rather obviously, opting out of bundles with Voxi is not a good idea. Not only will you not have any data, but you’ll also be paying top end prices for calls and texts. Voxi bundles expire after 30 days. Any extra credit you add onto your account will not expire as long as you use your phone once every 180 days. Any data you use on Facebook, Twitter, Instagram, Pinterest and Snapchat will NOT be deducted from your monthly data limit. This is included free with every Voxi 30-day bundle. Any data you use on Facebook Messenger, Viber or WhatsApp will NOT be deducted from your monthly data limit. This is included free with every Voxi 30-day bundle. If you pay an extra £7 a month then any data you use on Netflix, Amazon Go Video, YouTube, My5, DisneyLife, Vevo, UKTV Play, and TVPlayer will NOT be deducted from your monthly data limit. If you pay an extra £5 a month then any data you use on Spotify, Tidal, Deezer, Apple Music, Amazon Prime Music, Napster, and Soundcloud will NOT be deducted from your monthly data limit. Voxi also offers a free phone case on sign up. Cases are designed by the hottest new British artists, but they only fit some varieties of phone, so you’ll need to check the Voxi website to see if your phone is included on the list. Sign up a friend to Voxi and you’ll both receive a £10 Amazon voucher. Voxi compares pretty well to prices with other networks. 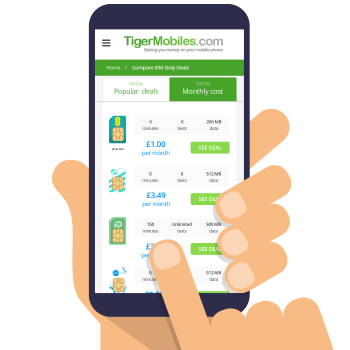 Their £10 package (unlimited minutes and texts and 6 GB of data) is matched only by iD Mobile’s £10 package (300 minutes, unlimited texts, 9 GB of data). Their £15 bundle is the cheapest on the market by far, and their £20 bundle (unlimited minutes and texts, 45 GB of data) is beaten only by Three’s £20 bundle (unlimited minutes and texts, 100 GB of data). However, throw in that endless social data and Voxi could easily be coming out way ahead of the pack. In short, Voxi is a fantastic deal for those who want lots of data and who use social media or chat apps often. If you’re a light phone user, then Voxi might not be for you. And if you’re not into using social media then again, it might be the right choice. Voxi are a SIM only network, so you’ll need to have your own, unlocked phone. Voxi will provide you with a free SIM card, but they do not sell phones, nor do they allow you to buy phones on contract. Voxi currently does not support WiFi calling, meaning you’ll need a solid mobile reception to make your calls (though since you’ll have unlimited minutes, this shouldn’t be a huge issue). They also do not support free WiFi hotspots, so you’ll need to use mobile data or connect to WiFi from a cafe or restaurant when out of the house. Voxi allows mobile tethering on any of their plans. This means that you can use your mobile data to get another device, such as a tablet, online. Do be aware that tethering can use up mobile data allowances quite quickly though. Voxi are a great budget choice for those looking for lots of data and endless data to use on social media and chat apps. If you’re not a big social media user, or you’re looking for a traditional pay as you go service, then Voxi probably won’t be right for you.